This is a painting I did recently for the KrabJab Studios show opening February 8th. 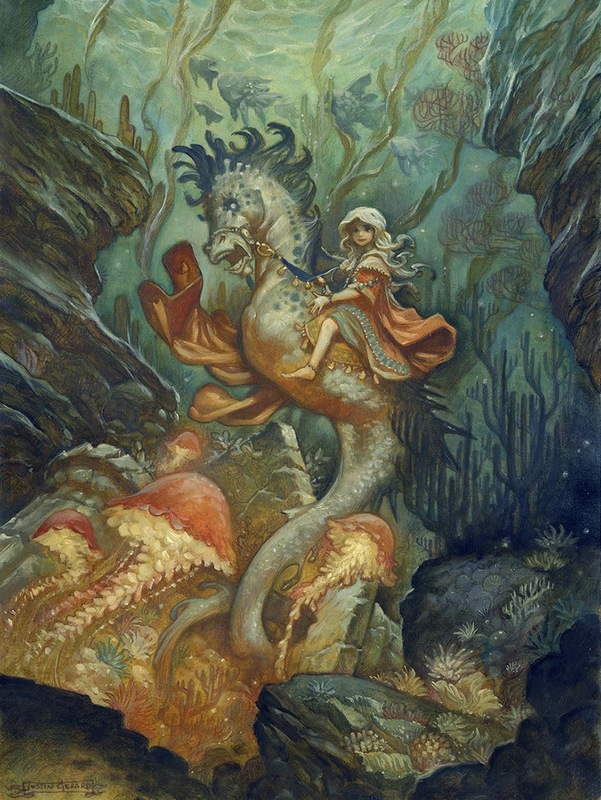 It started as an art history mash-up of Fairy art and Old Western Art. By Fairy Art I mean the classical Victorian paintings that involved magical little people in fantastic forest environments. By Old Western Artwork, I mean the American paintings that prominently featured cowboys and indians, Texas, cattle drives, stagecoach robberies, and any painting that involves Teddy Roosevelt. Why? Because they have absolutely nothing in common and it seemed like a really good challenge. 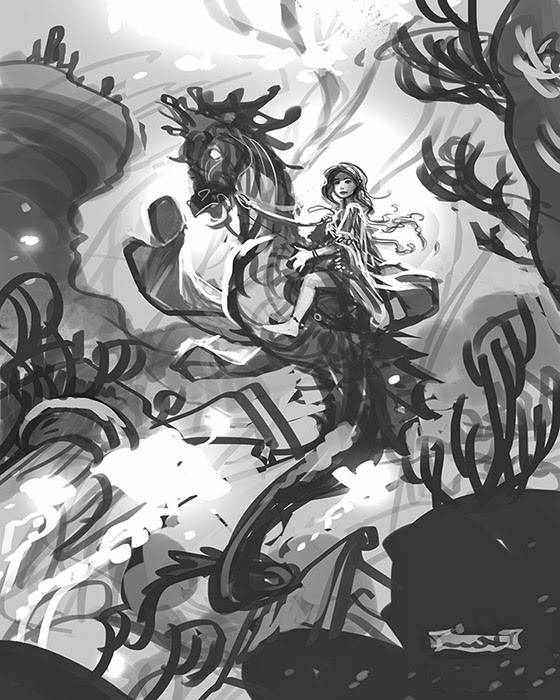 For the Wild West aspect, I wanted to try one of those scenes that involves a cowboy on a leaping horse which has just been spooked by a rattlesnake. 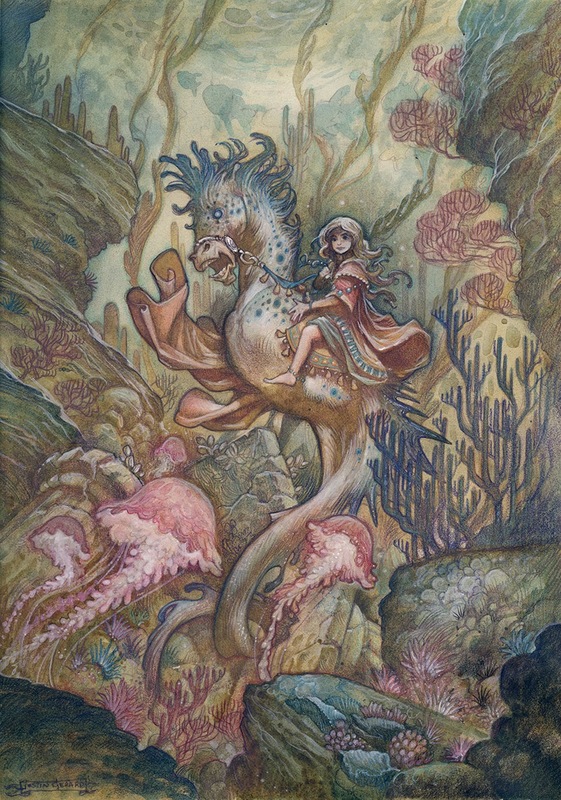 Since we are working with fairies here, we fired the horse and got a seahorse instead. We also sacked the rattlesnake as well, and picked up a few Jellyfish. One interesting problem I ran into rather quickly was that, without legs, it is hard to make a horse look panicked. Oh well, onward! It's too late now. The deadline is nigh! Now we've got to find a way to make this work. That is the fun of a challenge like this. The trick will be to make this legless horse's expression and his tail convey the panic that those horses in the wild west paintings would able to show through their contorting legs. STOP WHAT YOU ARE DOING AND DON'T STING ME! After having found a way to make the seahorse seem panicked, I realized that I now needed to deepen the environment more. 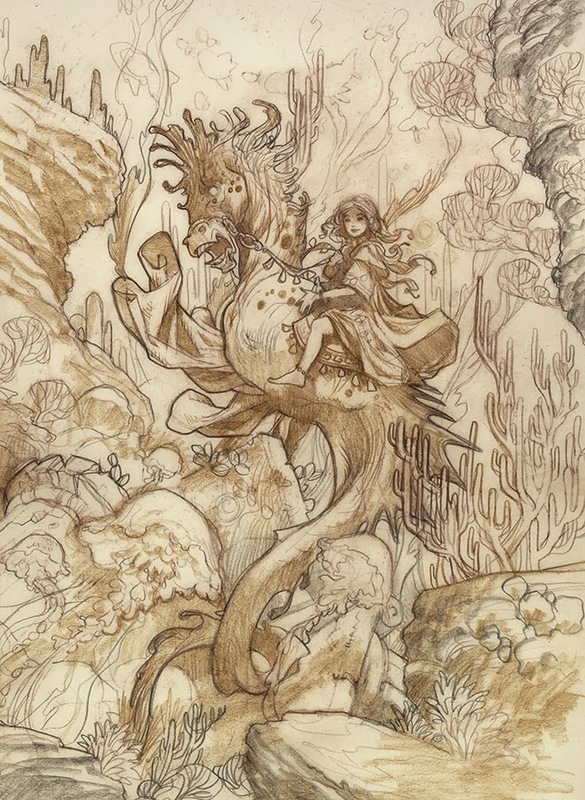 It needed more of that magic that the Victorian artists injected into their Fairy Art. So I seal the entire watercolor painting with spray fixative and a thin layer of matte medium. After this has cured I add a layer of oils over it. 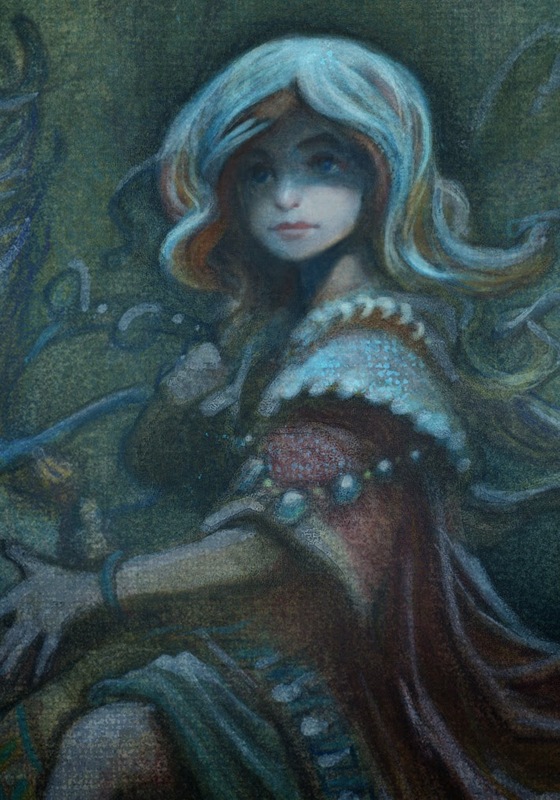 The oil gives a subtlety and depth to the image that I would have a hard time achieving with watercolor alone. Lastly, because I can't help by tinker... I did a quick digital experiment over the watercolor. Part of my love of digitally monkeying with my work is that I can zoom in so close and do really interesting detail work. My vision isn't quite what it used to be, but I still want to get down into the details because there are always such wonderful little stories to tell in them. I wish I had cyborg vision like in the movies. You know, like Iron Man can't quite see what that thing is over there. And BOOM! He can see it. That is what I want. If you get a chance stop by and see the show at KrabJab on the 8th!